Oil changes are sort of an annoyance, aren't they? It seems like my husband is constantly telling me that he needs to change the oil in our main family car. I'll say, 'Didn't you just change it?' He'll gently remind me that the last oil change was 5,000+ miles and two long car trips ago and that it needs to be changed before our next out of town adventure. It's true- we do a lot of driving in town, out of town, and even out of state. We love to travel in our own vehicle for the sake of convenience, and in order to keep traveling, we have to keep our vehicle in tip-top shape. I'd never really thought about why it's so important to keep up with regular oil changes until my husband brought up a few fun facts. Oil changes are part of regular maintenance on a vehicle, and they're very important. 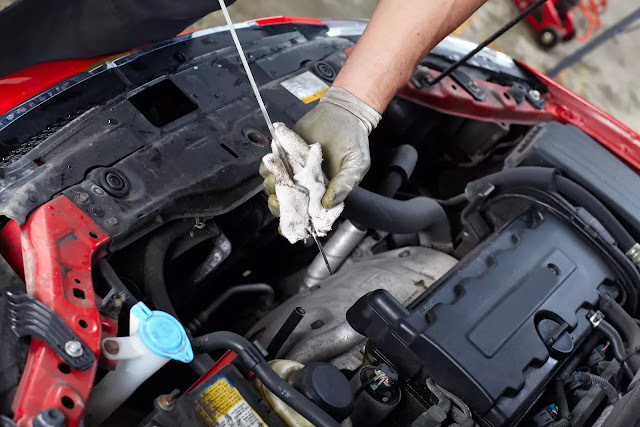 There's a reason why the service station puts that little cling on your windshield, letting you know the date you need to have your next oil change performed by, or the mileage, whichever comes first. In our case, it's almost always the mileage that comes first, as we drive a lot. My husband usually prefers to change the oil in our cars himself, but sometimes we're on a time crunch and it's easier to take it to the dealership and have them do it. Either way, oil changes are not something to forget about. Regular oil changes ensure that your car runs smoothly and lasts a long time. Isn't it funny to think that something as simple as an oil change can easily be overlooked, but also contribute to problems down the road if ignored for too long? Oil change frequency varies on your car make/model and really kind of depends on who you talk to. Some people think cars can last 10,000 miles on their oil, others say not even half that. A nice general rule is every four to six months, or somewhere around 5,000 miles. If you have a newer car, you'll be scheduled for regular maintenance, which will include regular oil changes. This is something that can actually take a weight off of your shoulders. The dealership will keep you posted by sending reminders as to when you should come in for an oil change. Many dealerships offer free oil changes to their customers and offer a nice lounge for you to wait in while your car is being serviced. Hopefully, the wait won't be too long, but remember- the wait it worth it to keep your car running safely and smoothly. Did you know that over 5% of the accidents that occur on the road today are due to poor or a total lack of car maintenance? Funny to think that something as simple as regularly having your oil changed can help prevent an accident. Make sure you have enough oil and are using the proper type of oil for your car. Having not enough, or the wrong type of oil can lead to decreased gas mileage, which will mean more money out of your pocket at the gas pump. Keep up with oil levels to save money at the gas pump. Oil changes are so important, and you should make sure that your car gets enough oil changes over the life of the car so you're getting your money's worth and keeping your family safe on the road at all times. When do you usually go for an oil change? Brought to you by Reedman Toll Subaru.